Gordon Ramsay is, in my opinion, one of the undisputed kings of reality cooking television shows. Ramsay has sired Ramsay’s Kitchen Nightmares (both British and American versions), Hell’s Kitchen and a slew of documentaries. His latest creation is Hotel Hell and the first taping was here in San Diego last December. I received an email a week before the taping asking me to promote the show on my blog. If you’re ever emailed me — I’m not counting the mailing lists but actually using my name — I will respond 97% of the time. With this email, I sent off a simple response saying that I would try promote the taping via Twitter and expecting in return at the very least a thank you. A few days later, the producer emailed me, requesting me to be food critic/guest per Chef Ramsay’s request. 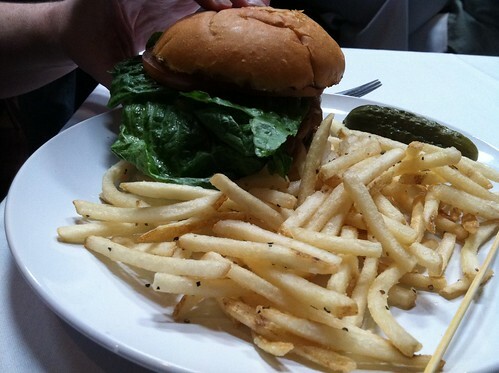 Not knowing what to expect, I was hesitant (and did Chef Ramsay really request lil ol’ me? Yeah, right). I had only seen one season of Hell’s Kitchen; if Hotel Hell was going to be anything like that show, I did not want to be a part of it. Buuuuttt curiosity got the best of me and I accepted, knowing that I won’t be dining alone: good friends, Christine and Steve were tagging along as well as dependable Paul. When we arrived outside of the Keating Hotel where the Merk restaurant is located, a camera and lights from an elevated crane were illuminating half of the block. This shiz was fo’ real. Before stepping into the Merk, we were brought to the pizza joint next door, asked to sign releases and each assigned a number. Holding up our numbers we took a group photo and were finally led inside the restaurant. All cameras were pointing at us. I don’t know how reality stars can act “normal” with a camera constantly in your face. The entire time, from walking in and during the entire dinner, I was nervous knowing everything I said could possibly end up on the final cut. I found myself laughing nervously, fumbling over words and making up too much fake talk. With the bright lights everywhere (there were no shadows), a camera in your face and everyone on edge, it was surreal. Prior to dinner, I was approved to live-tweet about the event and allowed bring my camera to document; other diners weren’t allowed to even bring a cell phone into the restaurant. Early into the dinner I had tweeted one thing about the beet salad my friend had ordered but apparently that was not enough for the producers. It seemed the assistant didn’t know squat about Twitter since she used the word “blogging” more than once and that I was only restricted to 140 characters on Twitter. “Was I live blogging from the restaurant? Could I blog more?” No, but I was live-tweeting it. Once she figured it out the difference between “blogging” and “tweeting” she asked me to tweet more about the food — and to do it often. She visited me several times during the evening to do follow-up tweets about the food. What did I think of it? Was it good? I had never felt the pressure to tweet more than I did that moment. I found out later that Chef Ramsay was reading some of my tweets out loud to the cooks. He particularly liked my tweet “Winner winner chicken dinner” regarding a fresh-from-the-oven chicken dinner Steve ordered. It seemed like that was the only highlight of the meal. But I’m getting ahead of myself. Beforehand, everyone in our party decided to order something different to give us a good idea of the menu’s range. You know, the usual standard for a blogger. Paul ordered a burger, I couldn’t pass up the braised lamb shank, Chris was curious about the lasagna and Steve had a roasted chicken. 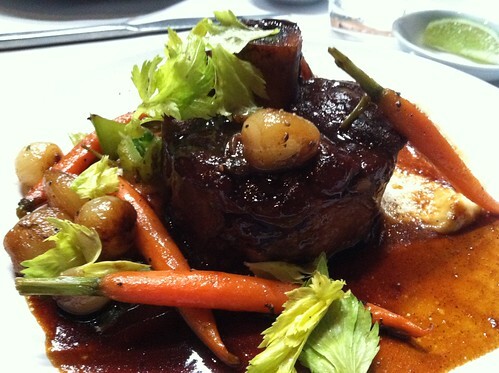 Most of the dishes, with the exception of the roasted chicken, arrived at our table stone cold. We all agreed that if the food arrived piping hot, our opinions would be different. Even after our complaint, the staff did nothing to remedy it. 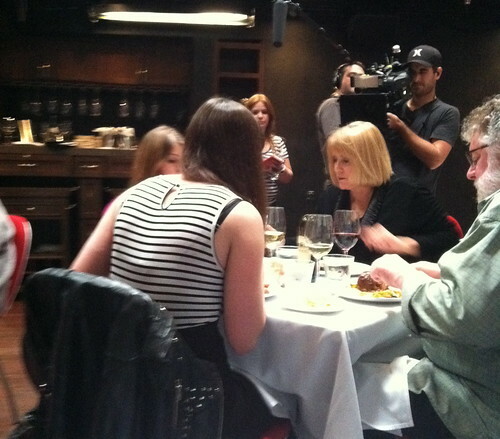 Halfway through the entrée course, we were “interviewed” on camera about what we thought about the food and whether we plan to return. While I thought the food was fine, I tried not to be too brutal about my actual opinions. I couldn’t help but feel like they were edging me towards admitting I enjoyed the food especially since this was the final evening to get some footage for the show. So, on camera, I said I would likely return to see how the restaurant has improved. If only they had waited until we got dessert, my response would have been different. In the middle of dessert, all the production lights were suddenly turned off and it was announced that Chef Ramsay had left the restaurant. While I had only made eye contact with him a few times (everyone was discouraged from oogling too much when he came into their line of sight), I was a little peeved there wasn’t much more than a few sightings. At the very least, I was hoping he would come to each one of the tables to personally see how we were doing. When dessert finally arrived, the chocolate marshmallow pie listed on the menu was actually a dessert pizza. 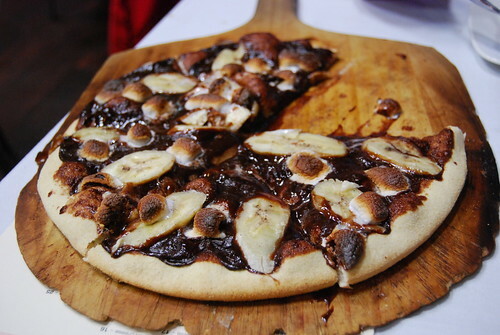 An unremarkable crust topped with chocolate, sliced bananas and marshmallows. I remember commenting that this was only something a stoner would concoct – it was horrible. Obviously, hanging out with friends for dinner and sharing the unease of being on camera was the best part of the evening. It’s something we’ll talk about in years to come. The entire experience was bizarre. I was still recovering from a cold and I felt off my game in knowing what to say without it sounding too forced. I won’t be overly disappointed if I was left on the cutting room floor. Hotel Hell featuring the Keating Hotel is slated for Monday, August 27 on Fox. Check your local listings for time. Oh man, that sounds like a crazy experience! Parts of it fun, parts of it a bit nerve wrecking. Definitely a one of a kind experience though! I’m going to the Keating on Monday for the show/tasting so it’ll be interesting to see how it all lives up. I agree that it’s an experience I won’t forget. I don’t remember how I managed to eat a bite since I was so nervous and a bit sick to boot. That is crazy. 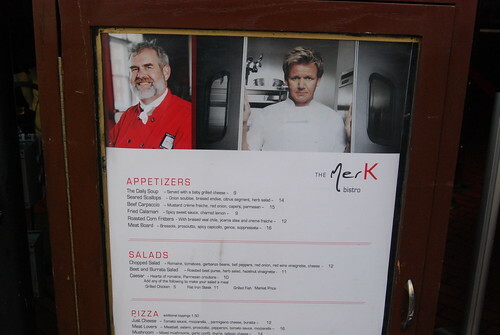 Gordon Ramsey intimidates me from inside the tv… I can’t imagine what it would be like to be in the same building! Definitely sounds like a neat experience, though. Sorry about the cold food. And the disasterous dessert. There’s no excuse for poor dessert. Admittedly, my biggest fear when I agreed to go to dinner was interaction with Ramsay. I don’t do well with shouty people. Whoa! That’s quite the experience. Love your write up on it and that GRamsay was reading your tweets to the cooks. If this was just a restaurant visit, I’d argue that stone-cold food and bad dessert are never worth a return. After the experience (and reading the others said about the episode), I’m leaning towards not returning. I’ll have to dvr that episode! Thanks for sharing your experience! I’d be scared to be in the same room with Gordon Ramsay. 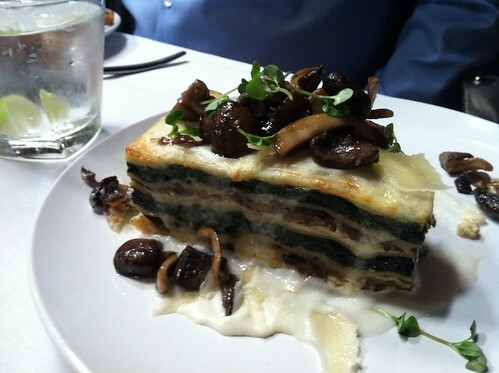 Too bad about the food (cold entrees + stoner dessert pizza). Boo. Glad you saw the other side to it. Unfortunate that they opted to show a positive side. Like you said, with the good and the bad, this is an experience you will talk about for a long time! Will be sure to check out the episode….and it must be so cool to have Gordon Ramsay reading your tweets! I’m sure the “winner winner” tweet will make the cut! Ha! Very true. We talk about how uncomfortable we were. Darlene, I went to C.C. High School with Dependable Paul, I have been reading your tweets and blogs. What a neat expreience you had and I hope you have others like itl Life is too small to not do crazy things like that. Oh, and. How was Pauls burger?? 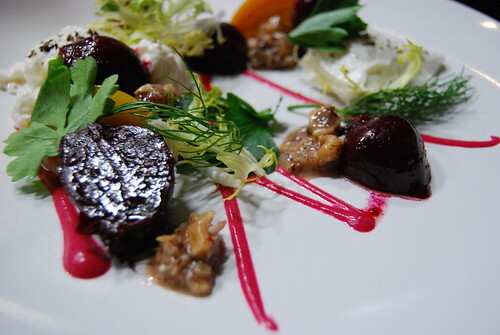 The beet salad looked really scrumptius…..so all in all was the dinner ok, throw it in the trash or somewhat safeable????? Hi! Thanks for visiting High School Friend of Paul. I don’t recall much about Paul’s burger except it was cold which seemed to influence my thoughts on the entire experience. The food was fine but a bit overpriced for what was offered and the execution. The total bill was over $130 for all of us. 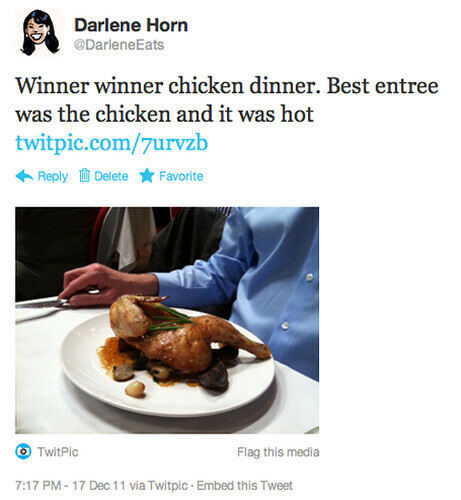 Were you in the blue near the end, Darlene? It was so quick but you were so cute taking a photo of your food! Unfortunately (or fortunately) I did not see the show. (We don’t have cable television.) But I was wearing a turquoise dress and taking photos of our dinner so it’s a possibility that it may be me. Stephanie – you are correct – that was Darlene and the Dependable Paul near the end. of the show. Not hard to miss Paul, especially with his wide-eyed “exciting food!” face. So – did you ever find out if Ramsay actually invited you, or was it just your stunning presence on the web that intrigued the producers? Ha! I honestly don’t know. I spoke to the producer before we left that evening but didn’t ask. Ha! Thank you. You’re too kind!